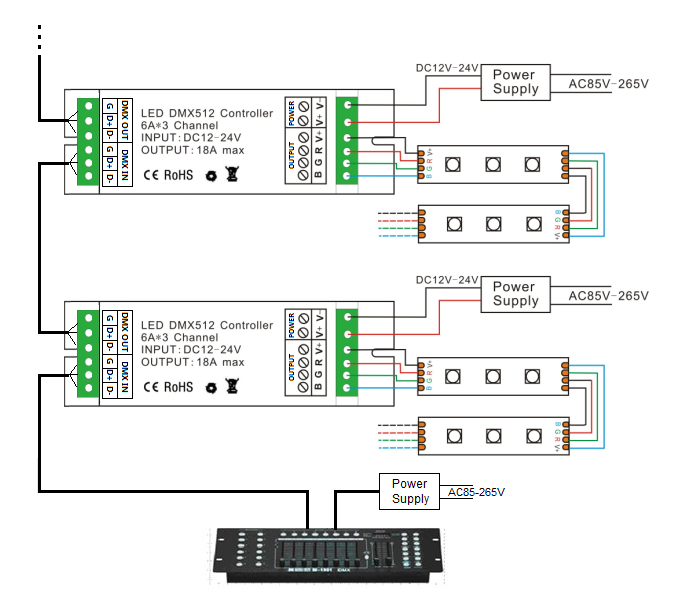 DMX512 decoder adopts the advanced micro control unit. It can receive the DMX-512 standard digital control signal which is internationally widely used. It changes the signal into PWM control signal to actuate the LED lamp. It can also connect the DMX digital master to change the light color or dynamic effect. ●As a constant voltage decoder, accept international popular DMX512 standard digital control signal, convert it to the PWM signal to drive LED lamps, applicable to a variety of constant voltage LED lamps, such as RGB LED module, lights, string lights, etc. continue to expand the channels up to 512, eventually be able to achieve more change in effect. ●When used alone, it also can be used as a RGB controller, with 9 modes in total, can be chosen by the DIP switch. ●There channels for RGB output, maximum current of 6A/CH. This product is in compliance with DMX512 protocol, compatible autoindex addressing and manual establishment address. As figure 4, when all switches are "ON" at the same time, the more value is taken as final. The state of decoder is gradual changing of test function. Its variable speed is 7. In addition, when signal indicator (green) blinks slowly, it runs the built-in program effectiveness of decoder. 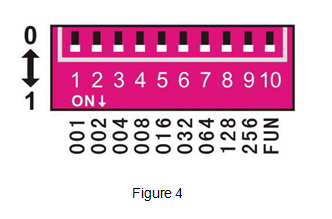 When the decoder receives the DMX signal, signal indicator will flash rapidly.